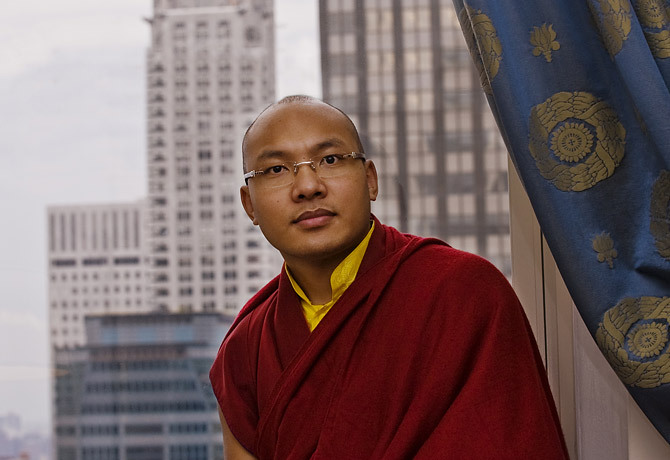 (TibetanReview.net, Mar31, 2018) – More than 18 years after his dramatic appearance in Dharamshala, India, following his escape from Chinese ruled Tibet, the 17th Karmapa Ogyen Trinley Dorje is finally permitted to visit Sikkim, the northeastern border state which is home to his principal exile monastery of Rumtek. However, it bears hastening to add that the permission is to visit any part of Sikkim except Rumtek in capital Gangtok. With support from the state’s chief minister, the Buddhist community of Sikkim has for long been urging New Delhi to permit the Karmapa to visit the state and his exile headquarter Rumtek. The Denzong Lhadey Tsogpa, an organisation of monks and monasteries in Sikkim, had called for a relay hunger strike in 2016 due to New Delhi’s refusal to permit the visit and has held several rallies pressing for the visit. The Home Ministry permit was confirmed by Sonam Lama, the Sangha representative in the state assembly. “I received the news yesterday. The Cabinet Committee on Security (CCS) has given their approval to Karmapa’s visit. However, I have learned that the Centre has restricted his visit to any part of Sikkim except the Rumtek monastery. Nevertheless, we are very happy. This is great news for Sikkim,” news18.com Mar 29 quoted Lama as saying. However, while thanking New Delhi for the “big approval”, Lama has made it clear that the relay hunger strike by the monks would continue till the Karmapa actually arrives in the Himalayan state. The relay hunger strike has continued for more than 630 days. The report noted that the Home Ministry’s clearance came days after Sikkim Chief Minister Pawan Chamling wrote to External Affairs Minister Ms Sushma Swaraj, seeking her assistance for Karmapa’s visit to the state. The Karmapa is currently on an extended visit to the United States. He has lived at Gyuto Monastery near Dharamshala since his arrival from Tibet in early Jan 2000 as a 14-year-old. The Karmapa is the head of the Karma Kagyu tradition and the oldest reincarnation lineage in Tibetan Buddhism. Ogyen Trinley Dorje’s recognition as the 17th Karmapa, while still in Tibet, was endorsed by the Dalai Lama in 1999. But rival claimants emerged after that, giving rise to a court case which is conceivably the main reason why he is not yet permitted to visit Rumtek.